Add the Disney Princesses to any room! Extra large wall mural featuring Belle, Aurora, Cinderella, Tiana and Ariel! 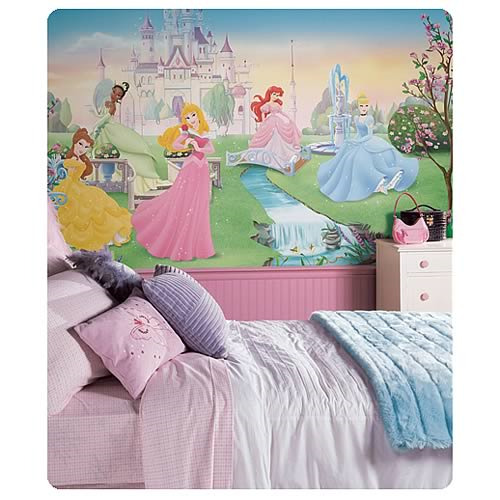 Dance with your favorite Disney Princess characters with this enchanting XL wall mural. Featuring Cinderella, Ariel, Belle, Aurora, and Tiana, a Disney Princess fan of any age will love this beautiful piece of wall decor. Applying is easy: simply dip each prepasted strip in a bit of warm water, then smooth it on the wall. You'll have a beautiful piece of Disney decor in under an hour! Match this mural with any of our Disney Princess wall decals (sold separately) to create a full princess theme! Measures 72-inches x 126-inches. Made in the USA.